I have some exciting news – I’m going to be teaching painting on canvas classes at Claytopia in Erie, PA! Shortly after I moved here, I met Gretchen from Claytopia. She invited me to teach painting on canvas classes there. I did a practice class last Friday, and it went really great! The classes will be standalone (not in a series) and each class will focus on painting a particular painting step-by-step. For the practice class, I did a painting of owls on a branch. Here I am showing how to paint the branch in a wavy line. And here, I am describing how to paint the shapes of the owls (my special trick!). My Aunt Stacy and my cousin Jake came too! 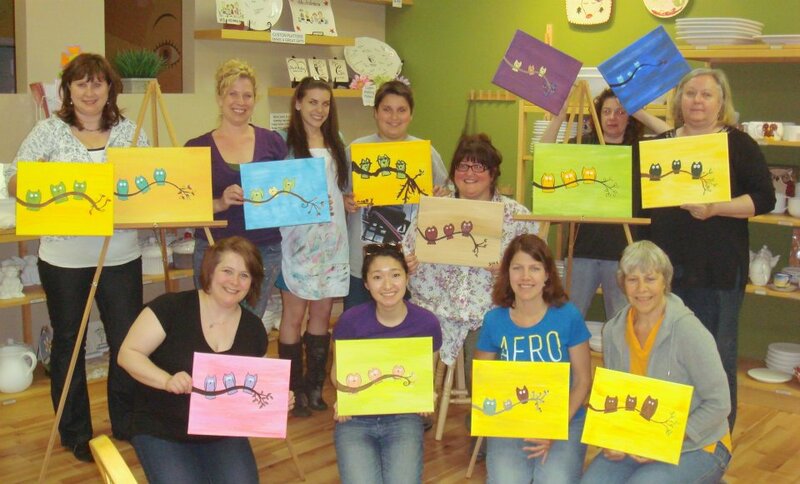 Here I am with all the students holding their paintings! I think they all turned out great, and they were each very different and unique! My next steps will be planning out the painting classes – I have a lot of ideas! Pajama night, girls night, boys night (dragon painting? ), and storytime + painting with kids. After I plan the classes I want to teach, they want a month to advertise it before I actually hold the class. The first class I do will probably be the same as the practice class though, since it is something I’m already familiar with. I will post updates as more stuff happens with this!